We offer a Health Check-up and Report. 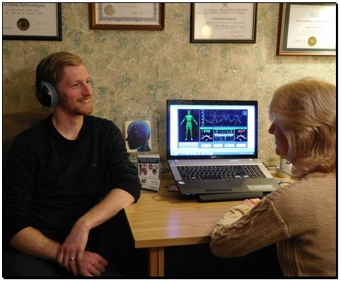 The Bio-Resonance first one to two-hour appointment involves doing a Scan of the brain and central nervous system, that provides a comprehensive illustrated report on the energy level (health state) of every major body organ. It reveals areas of weakness and strength. The process is safe and non-intrusive, there is no discomfort involve. The second follow-up session is where Mary will present a comprehensive illustrated report and explain in actionable steps her suggestions to promote healing and restoration. These suggestions often involve diet adjustments and the addition of certain supplements. The premise is “the body will heal itself, if you give it what it needs”. Follow up therapy sessions may be recommended. Restorative low frequencies that will stimulate, literally increase the energy level of the ailing organs being targeted will be transmitted via the same transducers headset to the brain and central nervous system. Health improvements can be felt and measured after just a few therapy sessions. Now for about the price of a dental checkup you can learn and measure your state of health! When our health is not in good condition, our body will automatically give out certain alarms, such as fatigue, body aches, headaches, insomnia, lack of appetite, depression, anxiety, stress, fear, bad temper, palpitations, dizziness, and so on. The Quantum Magnetic Resonance Analyzer (QMRA) is the newest most advanced Bio-resonance analyzer. It is designed to provide the most accurate diagnostic results because it focuses on the source, the brain. Therefore, the mind is where we begin accumulating information on the changes that occur in the body. The sensors in the headphones placed on the ears of the subject will trigger the brain to communicate the frequencies that occur within the body. Each and every change at the cellular level will be detected and identified, whether the challenge is bacteria, parasite, heavy metal, food allergies or any disease manifestation or biochemical being, it will be detected by recognition of its unique frequency/signature and be identified by name and development stage. Having a Bio-resonance Scan is a simple and enjoyable process. Mary will first make sure that you are sitting comfortably, and are wearing the transducers headphones that will assist in measuring the frequency of your brain waves. You will then be asked questions about your present state of health and your medical history. A comprehensive body scan takes about 30 minutes with appointment time being 1-2 hours. You will be asked to return for a follow-up appointment, during which the report will be presented and recommended personalized treatments will be discussed. These may include further use of the Bio-resonance scanning equipment for energy frequency re-balancing for your therapy. This treatment is not suitable for individuals with pace-makers or other electronic device implants, epilepsy, or who are organ transplant recipients. This treatment is not suitable for pregnant or lactating women. This treatment is not suitable for children under 10 years of age. No food or beverages (especially Tea, Coffee, Pop) should be eaten for 2 hours before their session. Consult your physician before you begin receiving treatment. Disclaimer: This information is for educational purposes only. Information is provided on the understanding that medical or professional services or advice are not offered. You should not use the information herein as a substitute for consultations with qualified health care professionals. Neither Mary Brickell, any employees of Healthy By Choice, the manufacturer or its agents or representatives can be held liable for any loss or damage resulting from the use or misuse of this service or any information contained here, nor for any errors or omissions.